When Michael Morton is officially cleared of wrongful murder charges on Monday, his lawyers will try to do something unprecedented: They will ask for a special inquiry into former prosecutor Ken Anderson's role in his conviction. 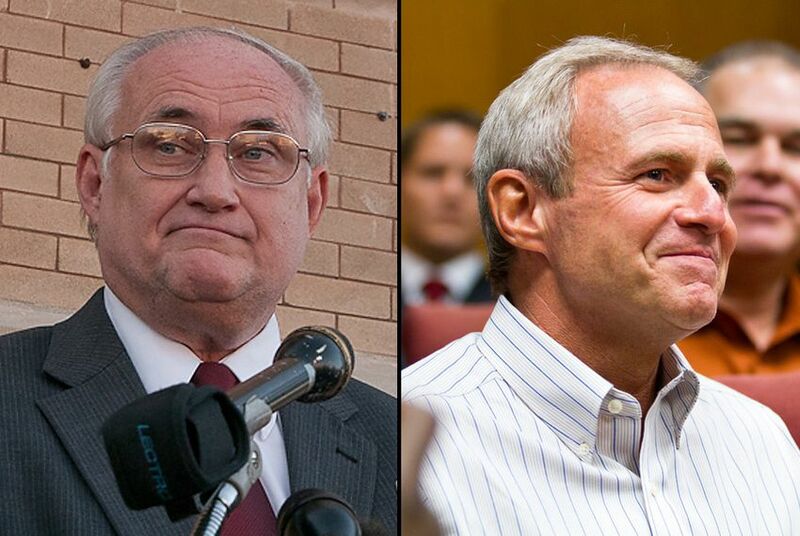 Updated 10:30 a.m.: Lawyers for Michael Morton this morning filed a report requesting a court of inquiry to examine the role of Williamson County state district Judge Ken Anderson, the former prosecutor, in Morton's wrongful conviction. A Texas man wrongfully convicted in 1987 of murdering his wife is scheduled to be officially exonerated on Monday. That is no longer so unusual in Texas, where 45 inmates have been exonerated in the last decade based on DNA evidence. What is unprecedented is the move planned by lawyers for the man, Michael Morton: They are expected to file a request for a special hearing to determine whether the prosecutor broke state laws or ethics rules by withholding evidence that could have led to Morton’s acquittal 25 years ago. The prosecutor, Ken Anderson, a noted expert on Texas criminal law, is now a state district judge. Through a lawyer, he vigorously denied any wrongdoing in Morton’s case. Morton, who was a manager at an Austin supermarket and had no criminal history, was charged with the beating death of his wife, Christine, in 1986. He had contended that the killer must have entered their home after he left for work early in the morning. But Anderson convinced the jury that Morton, in a rage over his wife’s romantic rebuff the previous night — on Morton’s 32nd birthday — savagely beat her to death. Morton was sentenced to life in prison. Beginning in 2005, he pleaded with the court to test DNA on a blue bandanna found near his home shortly after the murder, along with other evidence. For six years, the Williamson County district attorney, John Bradley, fought the request for DNA testing, based on advice from Anderson, his predecessor and friend. In 2010, however, a Texas court ordered the DNA testing, and the results showed that Christine Morton’s blood on the bandanna was mixed with the DNA of another man: Mark A. Norwood, a felon with a long criminal history who lived about 12 miles from the Mortons at the time of the murder. By then, Morton had spent nearly 25 years in prison. Norwood has been arrested and charged in Christine Morton’s death and is a suspect in a similar murder from 1988. The filing by Morton’s lawyer, John Raley of Houston-based Raley & Bowick, and attorneys from the New York-based Innocence Project, which represents prisoners seeking exoneration through DNA testing, is asking for what is known as a “court of inquiry.” The attorneys lawyers did not share the document with reporters but answered questions about it. They will ask the court to determine that there is probable cause to believe that Anderson withheld reports that the judge in the 1987 trial had ordered him to turn over. Judge William S. Lott had demanded the documents to determine whether they might help Morton’s case. Finding nothing exculpatory in the small number of documents he was provided by the prosecutor, the judge ordered the record sealed. In August, however, a different judge ordered the record unsealed, and Morton’s lawyers discovered that Anderson had provided only a fraction of the available evidence. Missing from the file was the transcript of a telephone conversation between a sheriff’s deputy and Morton’s mother-in-law in which she reported that her 3-year-old grandson had seen a “monster” — who was not his father — attack and kill his mother. Also missing were police reports from Morton’s neighbors, who said they had seen a man in a green van repeatedly park near their home and walk into the woods behind their house. And there were even reports, also never turned over, that Christine Morton’s credit card had been used and a check with her forged signature cashed after her death. In October, Judge Sid Harle, of Bexar County District Court, freed Morton based on the DNA evidence and authorized an unusual process allowing his defense lawyers to investigate the prosecutor’s conduct in the original trial. The lawyers questioned the lead sheriff’s investigator, an assistant district attorney who worked with Anderson and the former prosecutor himself. In their accounts, the witnesses said Anderson had firmly controlled every detail of the prosecution. In his own two-day deposition, however, Anderson said he recalled few details of the case and asserted that he had done nothing wrong. He said that he had interpreted the judge’s order to disclose the reports as a narrow demand for the initial documents from the investigation and that he felt “sick” over Morton’s wrongful imprisonment. If the court of inquiry ends with a finding that Anderson committed serious acts of misconduct by concealing material evidence, it could lead to disciplinary action by the state bar association and possibly even a criminal prosecution. Experts, however, are skeptical that Anderson could face serious punishment or disbarment, even if the court were to decide that he had committed malfeasance. Susan R. Klein, a professor at the University of Texas School of Law who specializes in criminal issues and prosecutorial ethics, said that such actions would be “incredibly unusual,” particularly after the Supreme Court’s decision this year dismissing a $14 million civil jury award against a Louisiana prosecutor, Harry Connick Sr., for his failure to turn over evidence that ultimately led to an exoneration. While withholding material evidence intentionally can get a lawyer disbarred, Klein said, “It’s extremely unlikely.” In the court filing, Morton’s lawyers argue that the amount of time that has passed since the trial may not be a bar to criminal prosecution if Anderson is found to have violated a court order; they argue that there may be no statute of limitations for contempt of court under state law. In an interview, Scheck said he hoped the court of inquiry proceeding would result in changes in law and policy that could promote greater fairness in criminal cases. Previous high-profile exonerations, he said, have led to new laws that improved access to DNA testing after conviction and provided generous compensation to those who were wrongfully convicted.